Your purchase is Non-refundable. You are purchasing a Downloadable copy of the Shopper Guide. After you make your payment you will be redirected to a page on our website where you can download the exact same copy as the printed version of the Shopper Guide. If you have trouble, Please read the information below. Thankfully most customers have up-to-date browsers and the process below works exactly as it should. Some other customers seem to be having difficulty receiving our email confirmation. We apologize, but cannot fix something that is out of our control. If you have trouble, Please read the information below. Your Shopper Guide will not (and cannot) be emailed to you. It is too large. It is a Downloadable file. If you have trouble, Please read the information below. There is no link on the PayPal website, or PayPal confirmation of your payment. 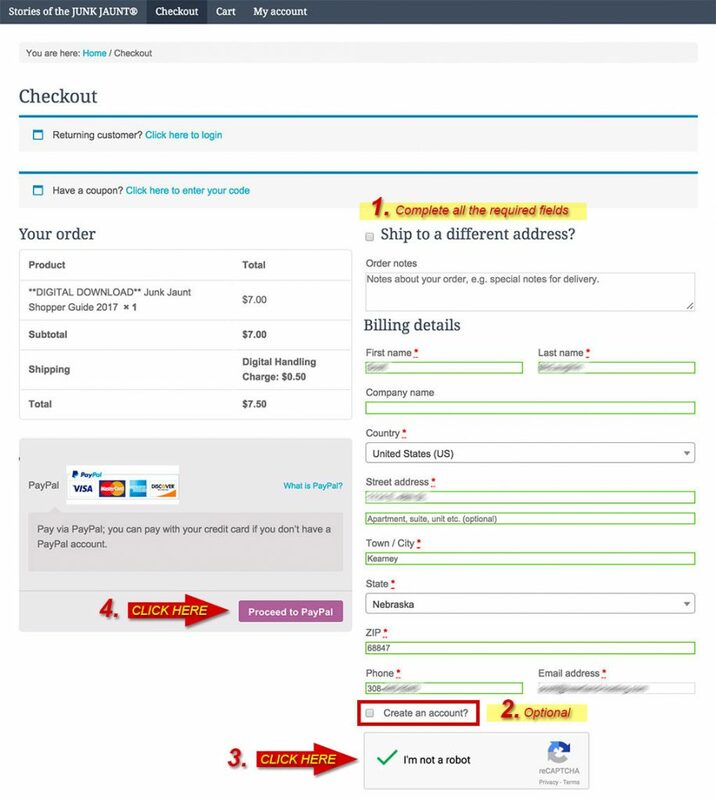 A separate Confirmation of your order is sent to your email address that you used during the checkout process. If you have trouble, Please read the information below. 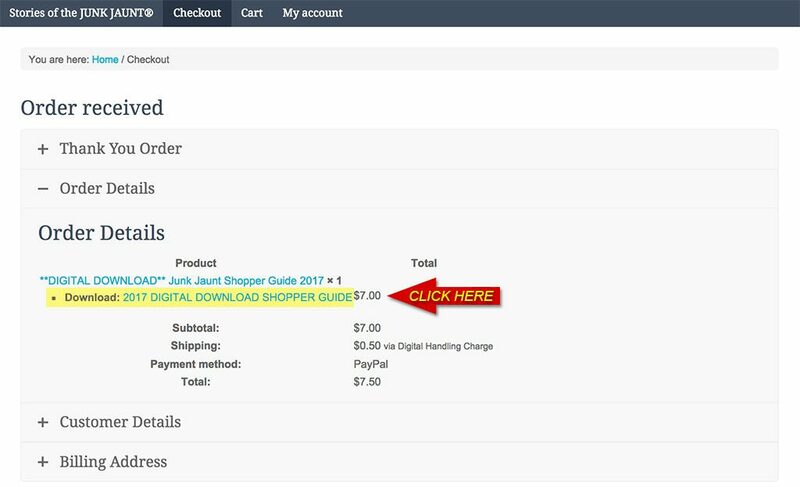 Your link to download your Shopper Guide is on the page that you are returned to after making your PayPal payment. 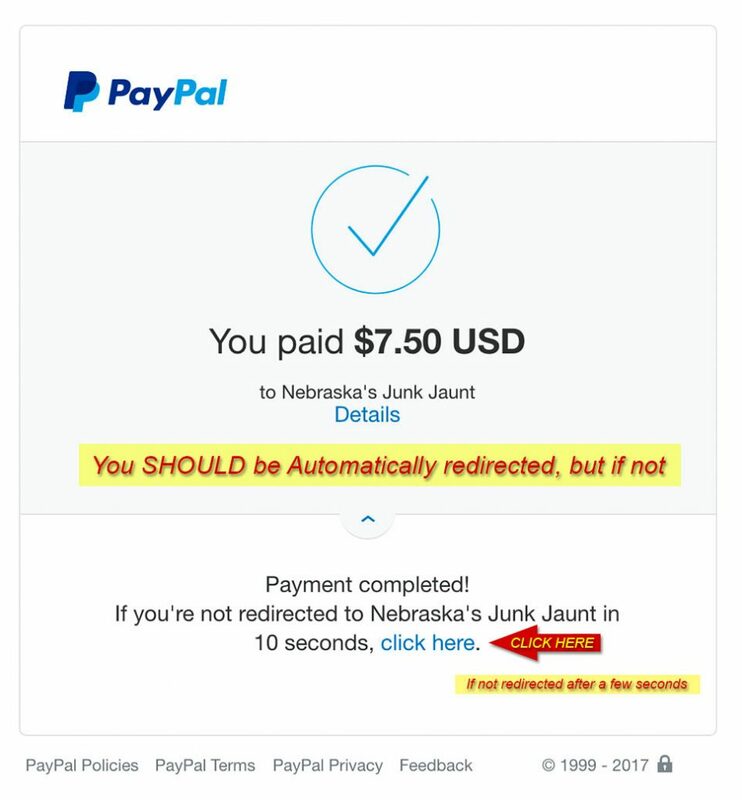 If you do not get redirected back to the Junk Jaunt website within 5-10 seconds, CLICK on the “CLICK HERE” link on the PayPal webpage to be redirected to our website. If you have trouble, Please read the information below. Look at the pictures below. The normal checkout process should take you to our Checkout page where you can click the “Proceed to PayPal” button after completing your personal customer information, and checking the box, “I’m not a Robot.” Occasionally reCAPTCHA will prompt you with a visual challenge to pick pictures that match a prompted question. You cannot proceed if the reCAPTCHA is not authorized. Creating an account is optional, however it will save your ordering information on the website which you can revisit at a later time. 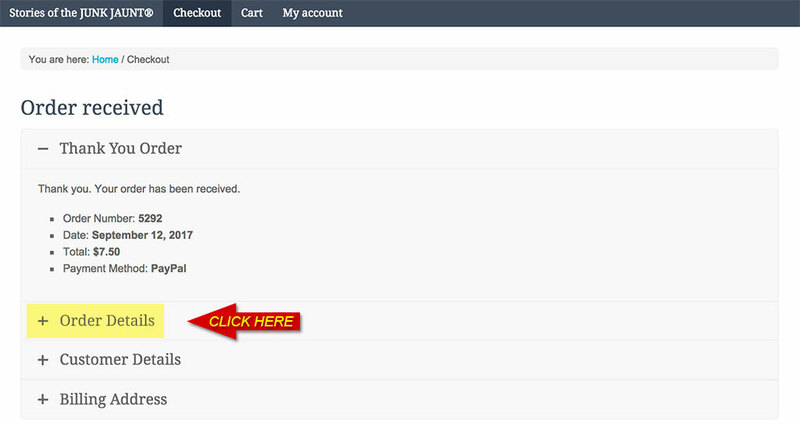 After completing the steps on the checkout page, click the “Proceed to PayPal“. You may pay with a PayPal account, or a Debit or Credit card. The next screen will be a PayPal screen saying “You Paid 7.50 USD“ to Nebraska’s Junk Jaunt. Your payment is now complete. 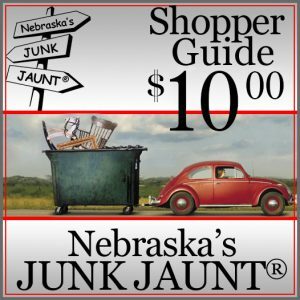 You should be almost immediately redirected to the JunkJaunt.com account order received page. You need to click on the tab labeled “+Order Details“. You will see a link next to the “Download:” label. If you are not redirected to the JunkJaunt.com website in a few seconds, visit https://www.junkjaunt.com/checkout/order-received/. 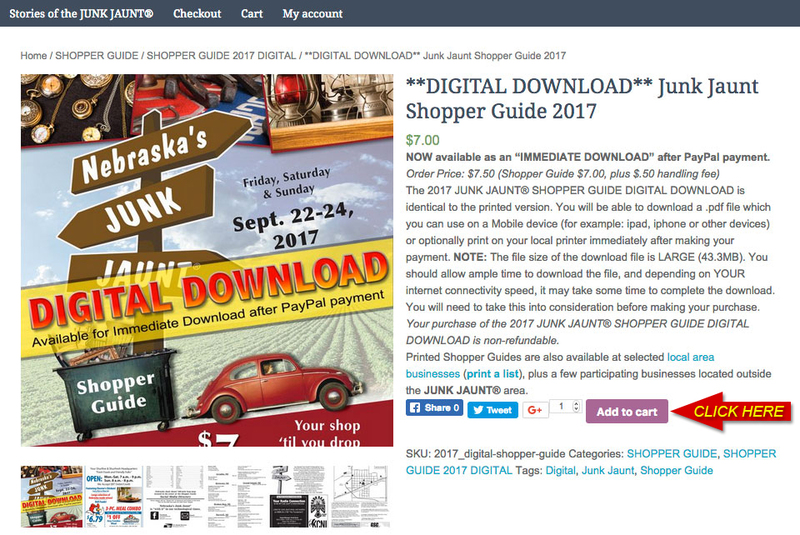 You should have also received an email confirmation from the website subject: “Your Nebraska’s Junk Jaunt order from &DATE, 2017 is complete.” In the notification, (see below) there will be a link, Download: 2017 DIGITAL DOWNLOAD SHOPPER GUIDE. Click on this link and save the document to your device. Note: On our iPhone and iPad, it downloaded the document directly to the device, and opened without any additional software. You can use this link an unlimited number of times. If you didn’t receive your email confirmation, first check your JUNK MAIL folder. Some Free email services (Hotmail, G-Mail, AOL, Yahoo) have been known to filter or even block the confirmation because it has a link embeded. Their server may recognize this link as possible SPAM or phishing mail. We apologize, but cannot control this, so you may need to visit your email support for answers. If you are still having trouble submit a ticket to support@heartlandhosting.com. We will do everything possible to get a copy to you.